Ever wonder how the power companies like Pacific Gas & Electricity (PG&E) began? Way back in the early days of the fossil energy industry, gas and coal was dug out of the ground and then fed via long pipelines or railroads to power stations to produce electricity. That’s where the “gas” in PG&E got its name — with gas. The gas was also fed directly in pipes into people’s homes – and fracked from under them too! So isn’t it time there was, for example – Pacific Wind & Solar? Now that the power of the future is renewable energy like solar wind and solar, shouldn’t electric utilities be allowed to sell just solar? But how would that happen? You can’t just set up shop to sell your solar to your neighbors! Electricity generation has always been heavily regulated as a “public good” – so becoming a solar electricity seller would take changes by pubic utility commissions to allow a completely new kind of power company, one that buys and sells renewable energy. The Australian Energy Regulator (AER) approved the first such licence in October 2015 – for Enova. Now the first solar electric utility has just been licensed to sell solar electricity to consumers in Australia. Enova is a community renewable energy firm based in the northern rivers region of NSW, and it is permitted to ship its solar-powered electricity anywhere on the eastern seaboard of Australia. Alison Crook, the chair of Enova’s board, described it as an “historic” event. noting that Enova Energy is the first community-owned organisation to get the right to sell electricity back to the community. They use the main electricity grid to transport energy because in Australia, unlike the USA, the grids are not owned by the retailers who sell the electricity. The utilities that did own grids in Australia have decided to separate the retail from the networks and sell of the retail base to other retailers. This results in no barriers to new entrants that want to sell power, like Enova. “Lots of other communities are saying that they want us to succeed, so that they can follow,”said Crook. The new license allows Enova to buy electricity generated by community solar gardens like COREM (Community Owned Renewable Energy Mullumbimby) as well as homes and businesses, and then sell it back to the community. 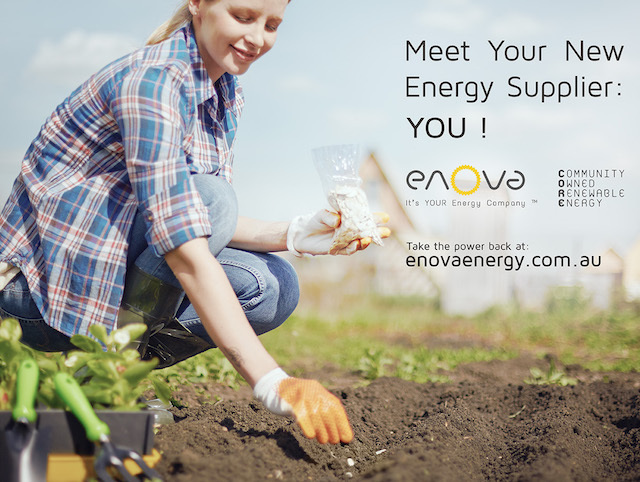 Just like any utility, the license allows Enova to enter into agreement with the local grid operator Essential Energy, to transport that energy onto the grid and get paid by the customers who want to buy it. As with any electric utility, you can be a shareholder in this first-ever pure solar electric utility in Australia. You can check online for the Enova prospectus as a potential shareholder. Because solar is sold in 25 year contracts at a set price – unlike gas or coal for example, with ever-changing fuel prices – this sort of solar utility would be a very safe investment, almost like a green bond or a solar yieldco. “Because it is local, Enova will be able to focus completely on its local customers, providing a personal level of service unique in the energy supply sector,” said Enova CEO Steve Harris.